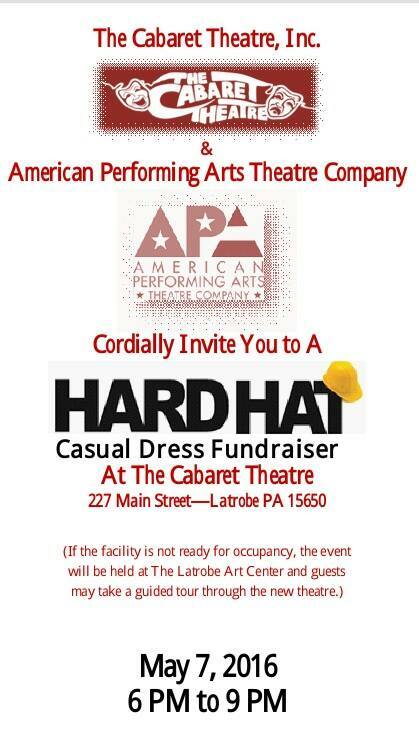 On Saturday May 7 forty-two people who support American Performing Arts arrived at The Latrobe Art Center for an evening of food, drink, entertainment, and a peek at what will soon be APA's permanent home at The Cabaret Theatre. Greeted at the door by Latrobe actor David Seremet, Ar,t Center Director Gabi Nastuck, and APA Artistic Director John Carosella, guests were invited to enjoy the open bar of complimentary water, soft drinks, beer (provided by Latrobe's own Four Seasons Brewery, and wine donated by The Central Theater Wine Shoppe in Herminie, PA. A beautifully-presented buffet of heavy hors d'eouvres by Chef Mark followed and while the guests enjoyed their food and drink, they were entertained throughout the evening by some of the wonderful talent gathered for the APA opening production of Man of La Mancha. Carolyn Jerz and Reed Demangone represented the younger element of the company and proved through their brilliant singing why they have been cast in next season's production of The Fantasticks. Accompanied by Aaron Gray (Music Director at Holy Family Church) and Cindy Baltzer (local actress and vocal coach), the "older" members of the cast, Javier Ferrer and Rebecca Laughner) also wowed the audience. Finally, the most "seasoned" member of the cast, David Seremet, ended the evening with a rousing rendition of "Nothing Can Stop Us Now" from the musical The Roar of the Greasepaint, the Smell of the Crowd. Violinist/Fiddler Brendan Kuhns entertained throughout the evening. And while the staff conducted the drawings for door prizes and raffles, small groups where escorted across Main Street to the Cabaret Theatre where they were greeted by Jay Michaels and Taran Winslow who created "the vision" for the visitors. ​By all accounts, the evening was a HUGE SUCCESS! Call us at 724-527-7775 and we'll mail you one.